What is a Market? A market is the interaction of buyers and sellers for the purpose of making an exchange, which establishes a price for the goods or. 1 What is a Market? 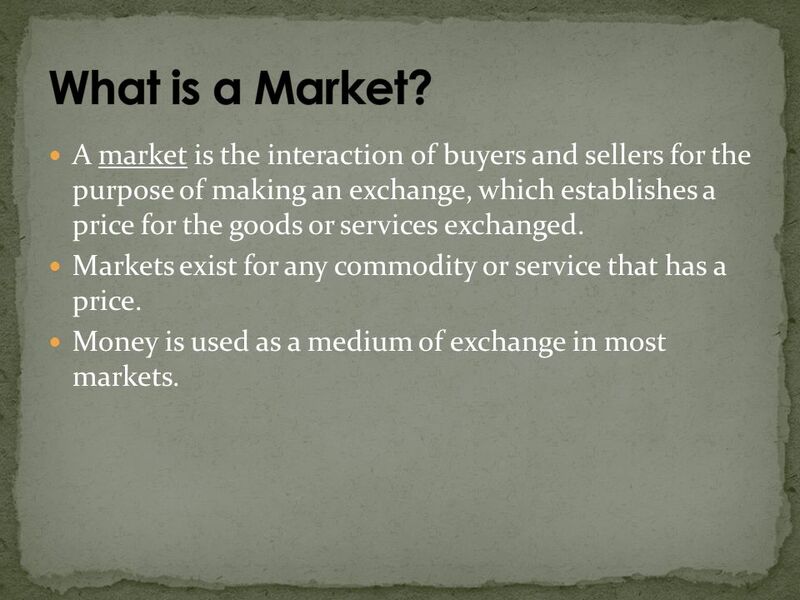 A market is the interaction of buyers and sellers for the purpose of making an exchange, which establishes a price for the goods or services exchanged. Markets exist for any commodity or service that has a price. Money is used as a medium of exchange in most markets. The demand side is the buyer’s side of the market. 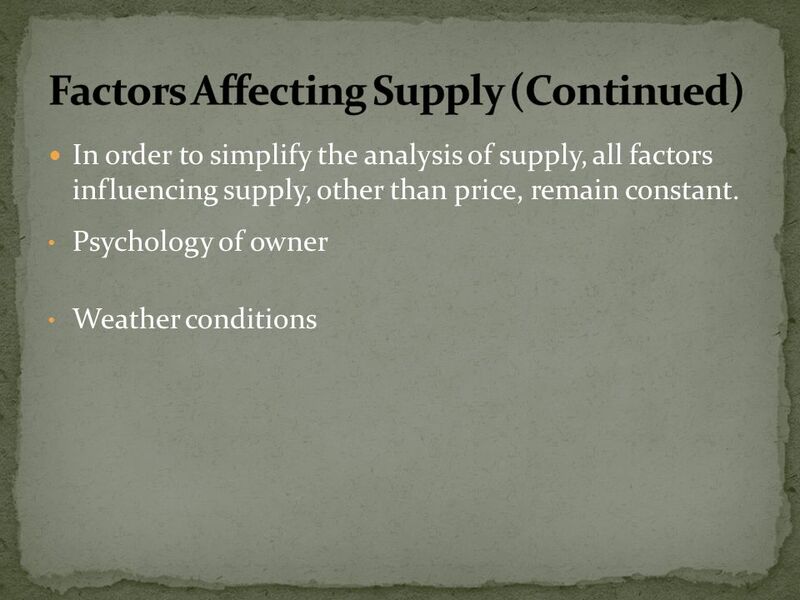 The supply side is the seller’s side of the market. 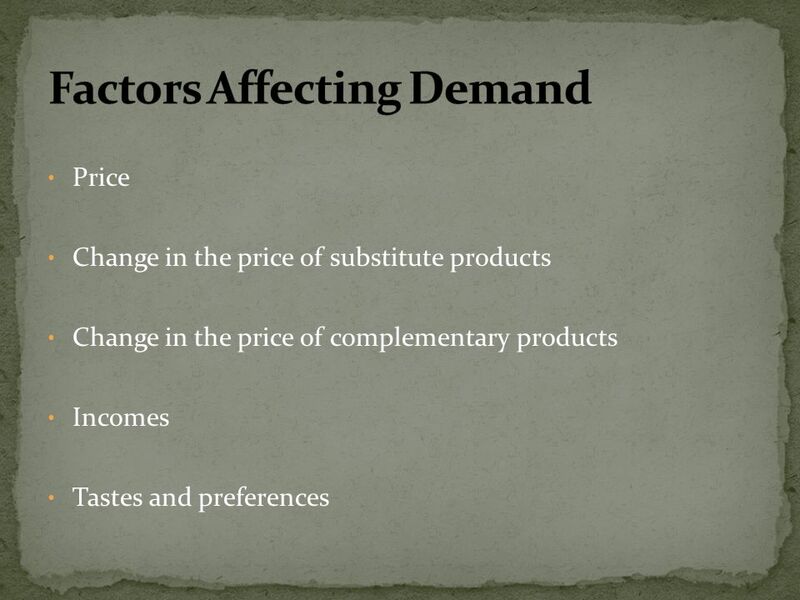 3 The Concept of Demand Consumer demand does not stay constant, it changes with various factors. Consumer preferences are transferred to the market in terms of the goods and services that consumers buy. 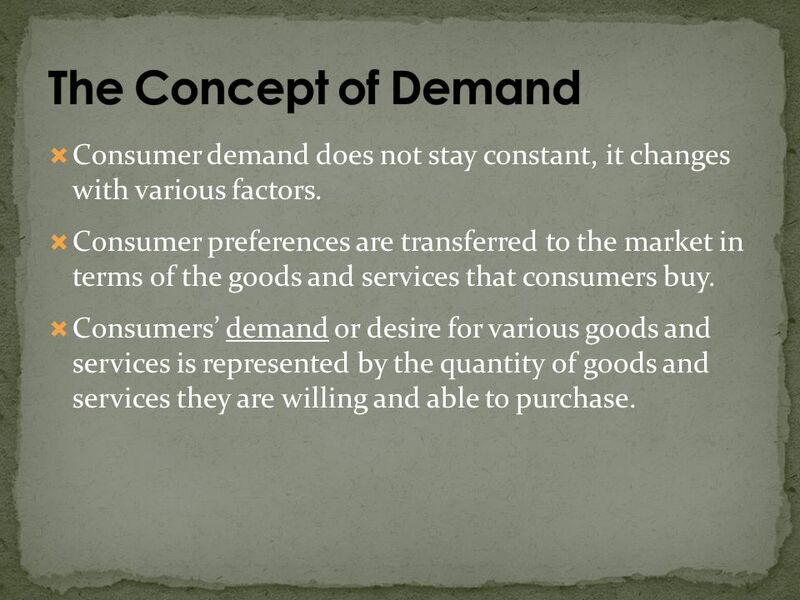 Consumers’ demand or desire for various goods and services is represented by the quantity of goods and services they are willing and able to purchase. When the price of a product increases consumers may substitute towards a relatively cheaper product When the price of a product increases, less of the product is purchased at the current level of income. 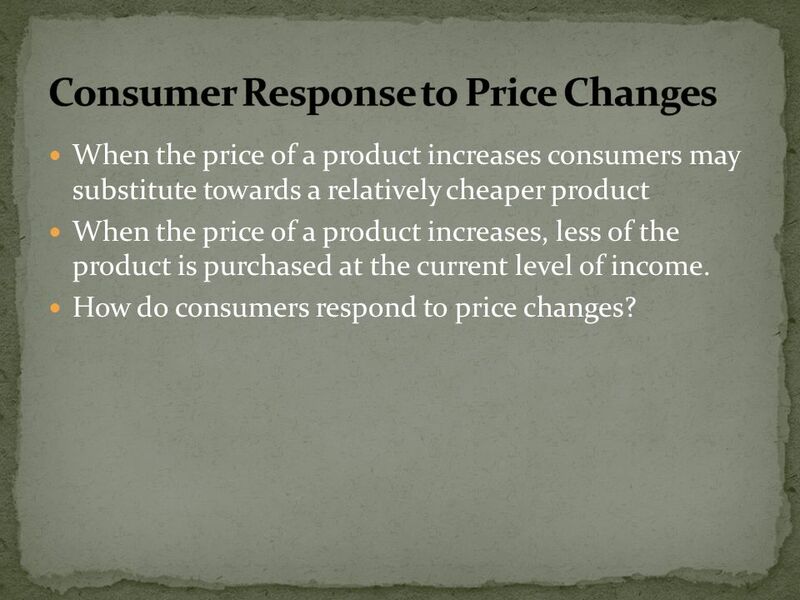 How do consumers respond to price changes? The inverse relationship between price and quantity demanded can be represented by a demand schedule and graphically by a demand curve. 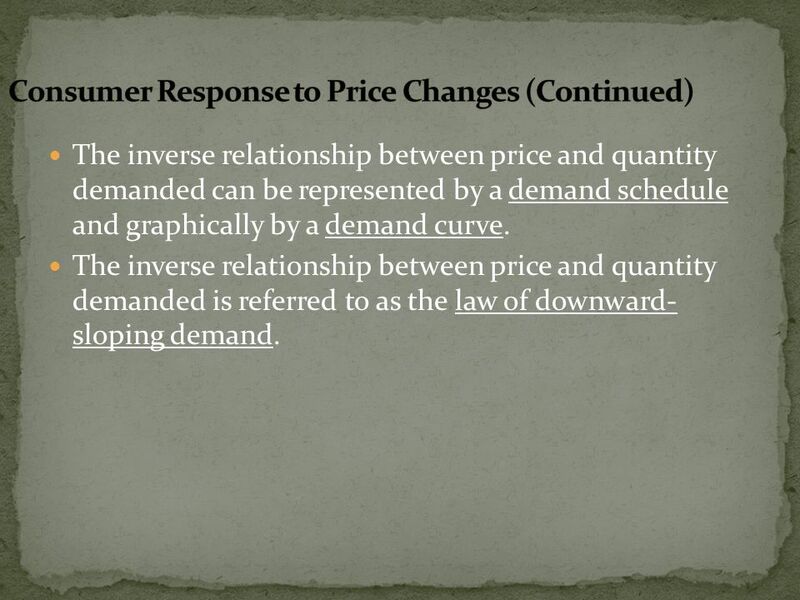 The inverse relationship between price and quantity demanded is referred to as the law of downward- sloping demand. An increase in the price of sandwiches leads to a decrease in the quantity of sandwiches demanded in one week, holding all other factors influencing demand constant. 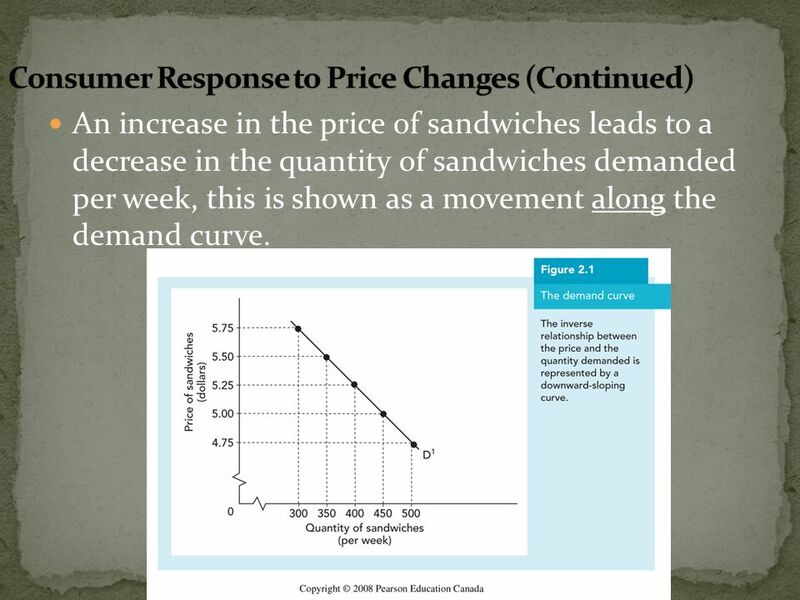 An increase in the price of sandwiches leads to a decrease in the quantity of sandwiches demanded per week, this is shown as a movement along the demand curve. 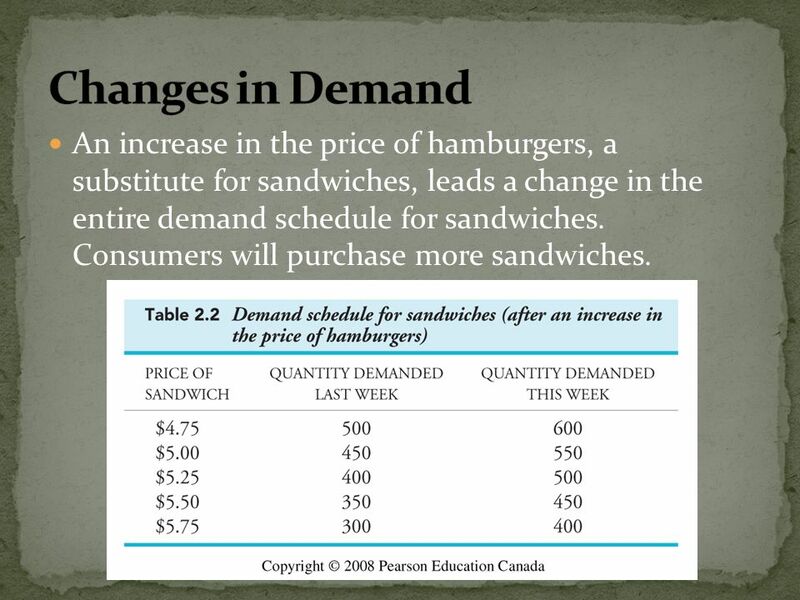 10 Changes in Demand An increase in the price of hamburgers, a substitute for sandwiches, leads a change in the entire demand schedule for sandwiches. Consumers will purchase more sandwiches. 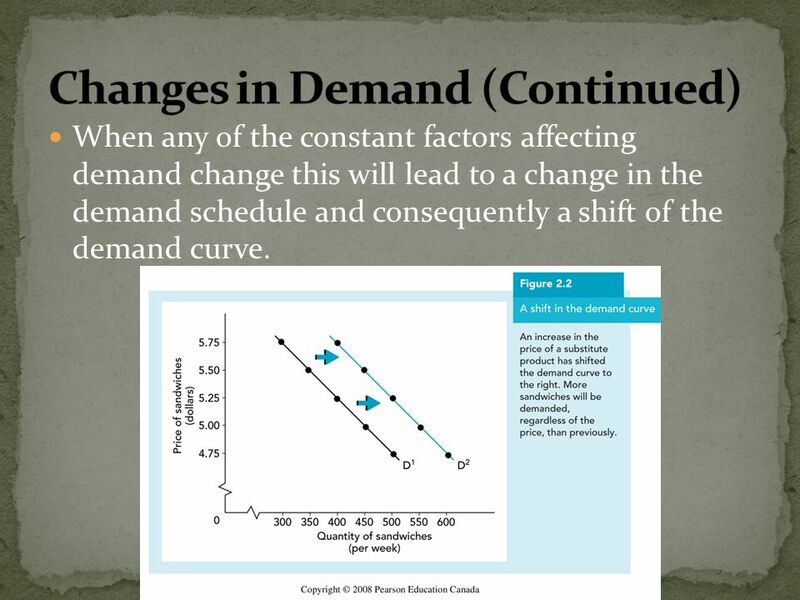 When any of the constant factors affecting demand change this will lead to a change in the demand schedule and consequently a shift of the demand curve. 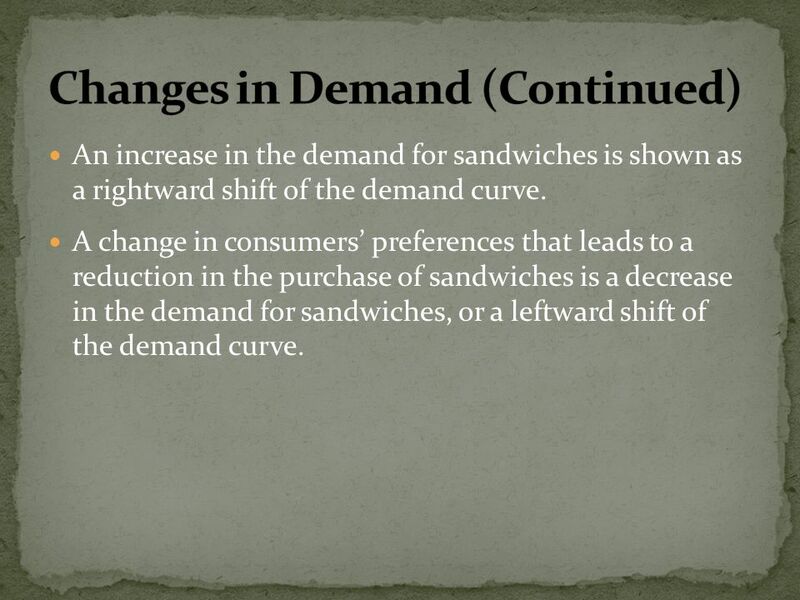 An increase in the demand for sandwiches is shown as a rightward shift of the demand curve. 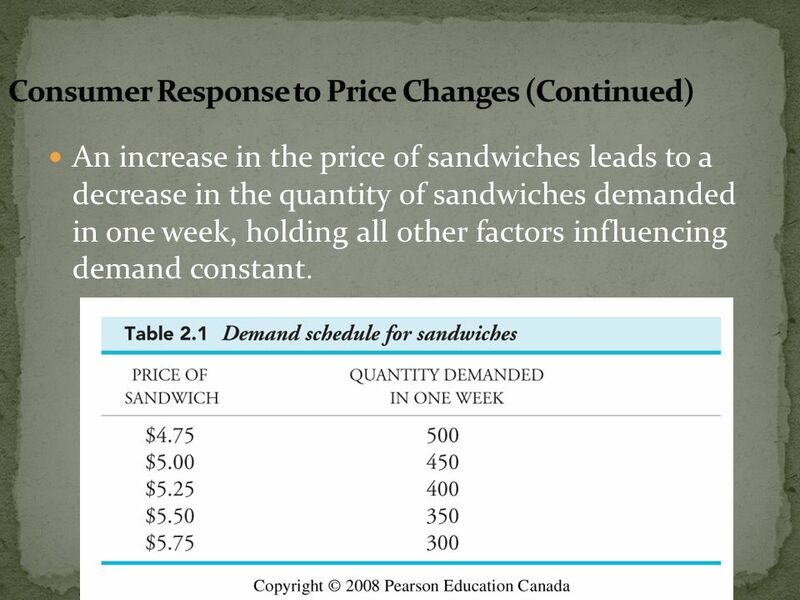 A change in consumers’ preferences that leads to a reduction in the purchase of sandwiches is a decrease in the demand for sandwiches, or a leftward shift of the demand curve. 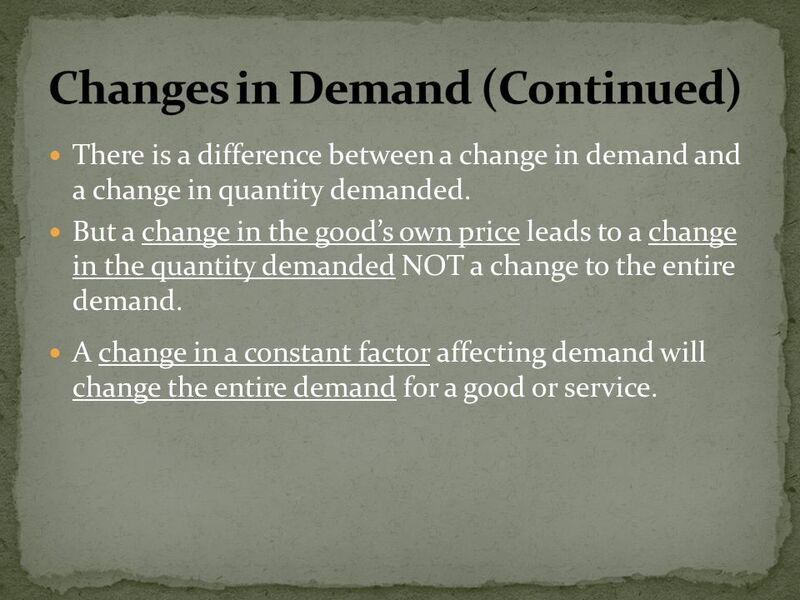 There is a difference between a change in demand and a change in quantity demanded. 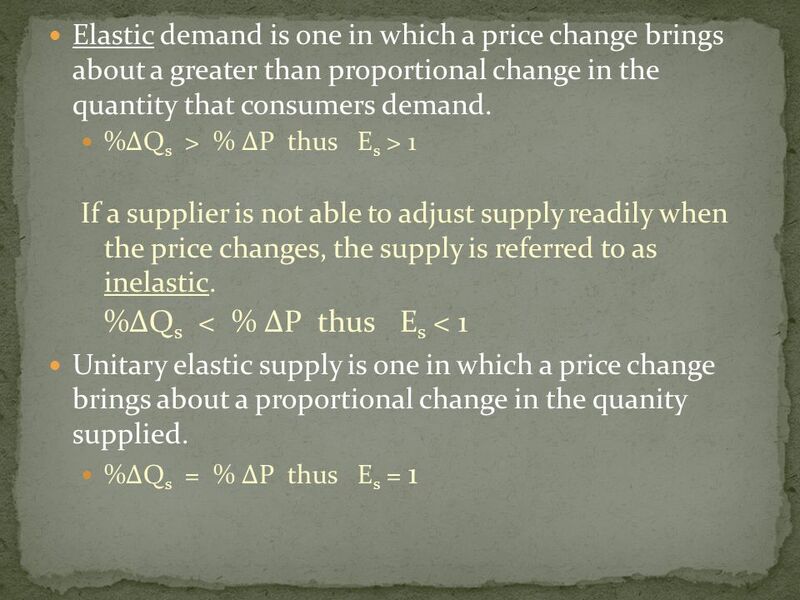 But a change in the good’s own price leads to a change in the quantity demanded NOT a change to the entire demand. A change in a constant factor affecting demand will change the entire demand for a good or service. 14 The Concept of Supply The supply side of the market is constantly changing as the number and variety of products available to consumers is constantly increasing. The seller’s side represents the quantity of goods and services that sellers are willing and able to supply or offer to the market. 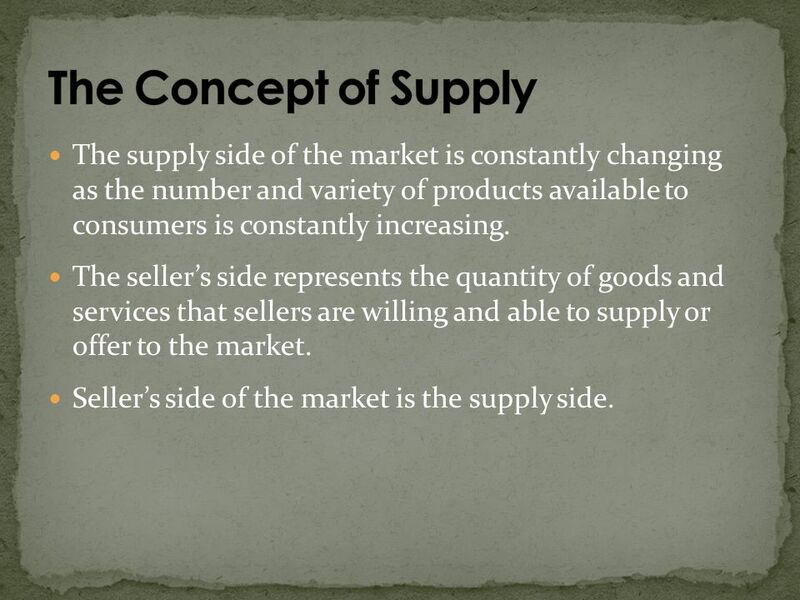 Seller’s side of the market is the supply side. A higher price must be obtained in order for the quantity supplied to increase. Additional costs of supplying more of a product to the market increase beyond a certain level of output. 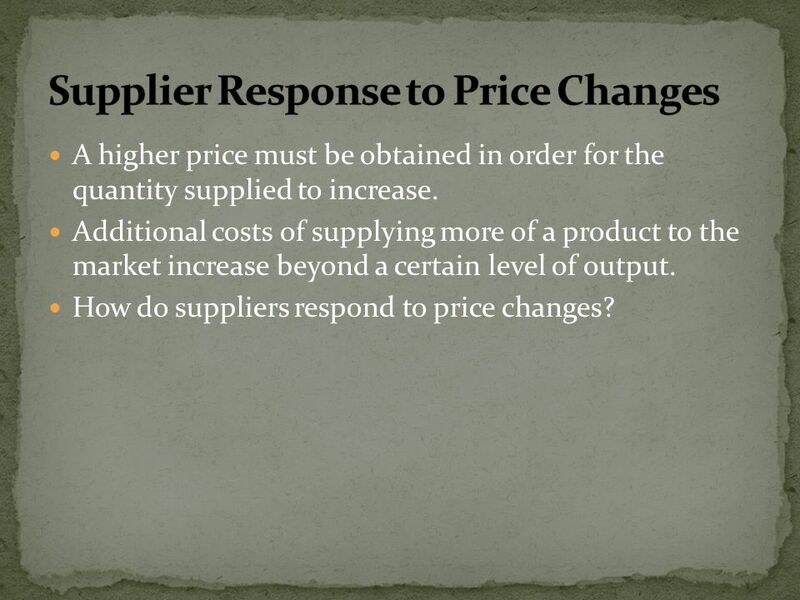 How do suppliers respond to price changes? The positive relationship between price and quantity supplied can be represented by a supply schedule and graphically by a supply curve. 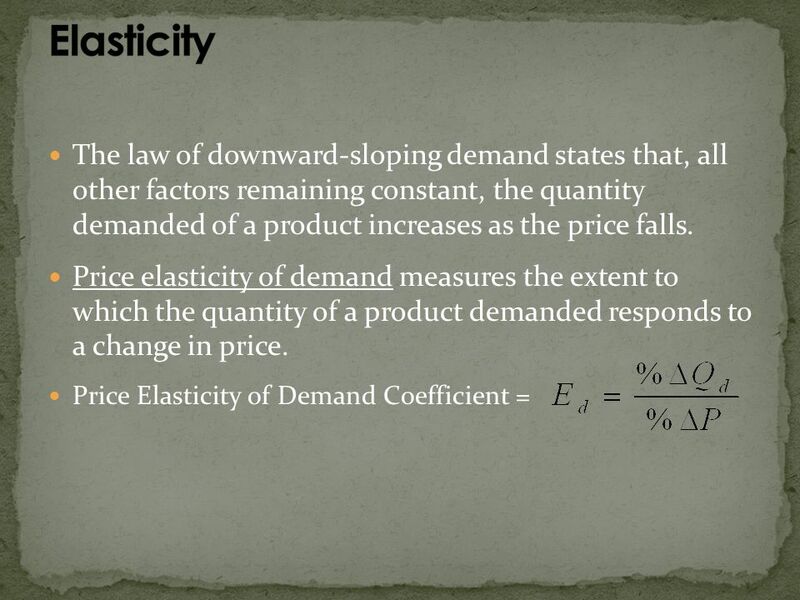 The positive relationship between price and quantity supplied is referred to as the law of upward-sloping supply. 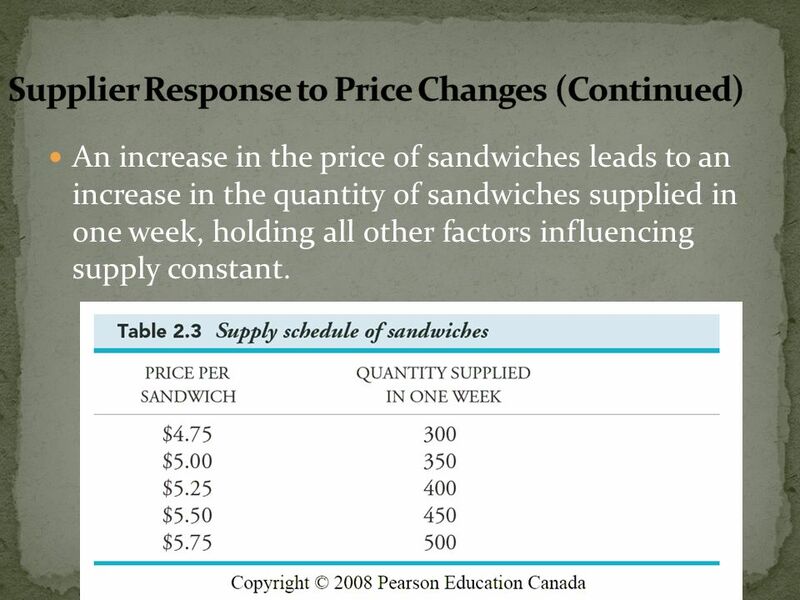 An increase in the price of sandwiches leads to an increase in the quantity of sandwiches supplied in one week, holding all other factors influencing supply constant. 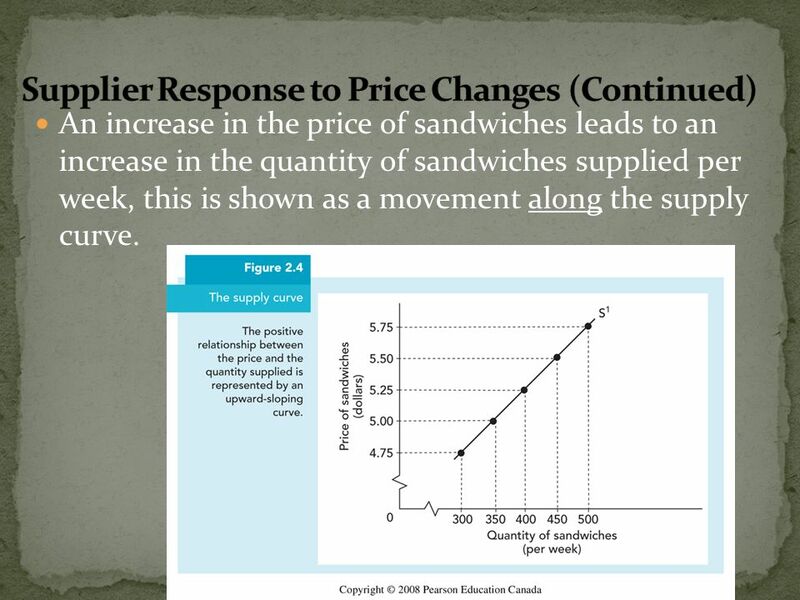 An increase in the price of sandwiches leads to an increase in the quantity of sandwiches supplied per week, this is shown as a movement along the supply curve. 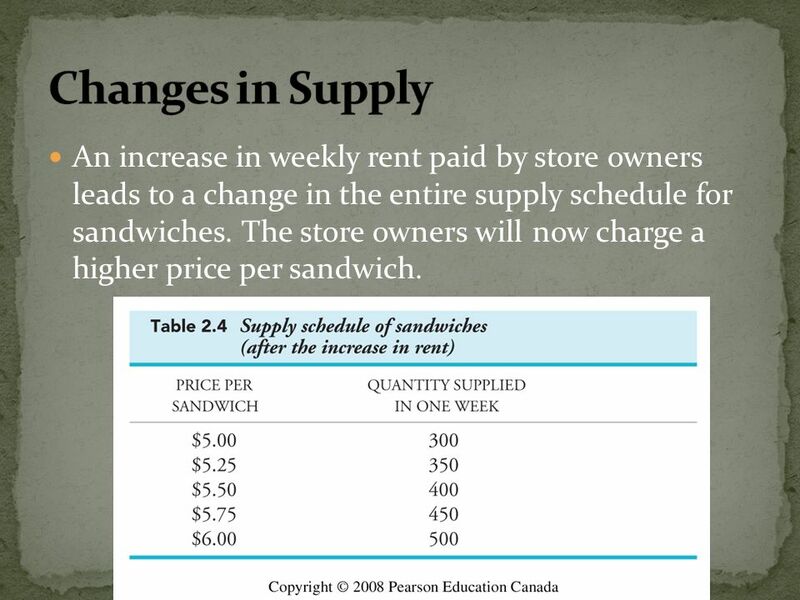 21 Changes in Supply An increase in weekly rent paid by store owners leads to a change in the entire supply schedule for sandwiches. The store owners will now charge a higher price per sandwich. 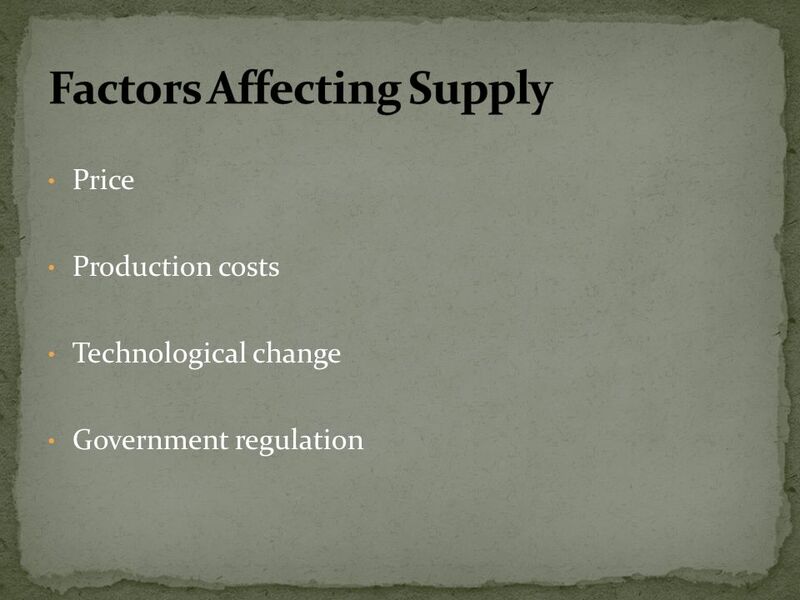 When any of the constant factors affecting supply change this will lead to a change in the supply schedule and consequently a shift of the supply curve. 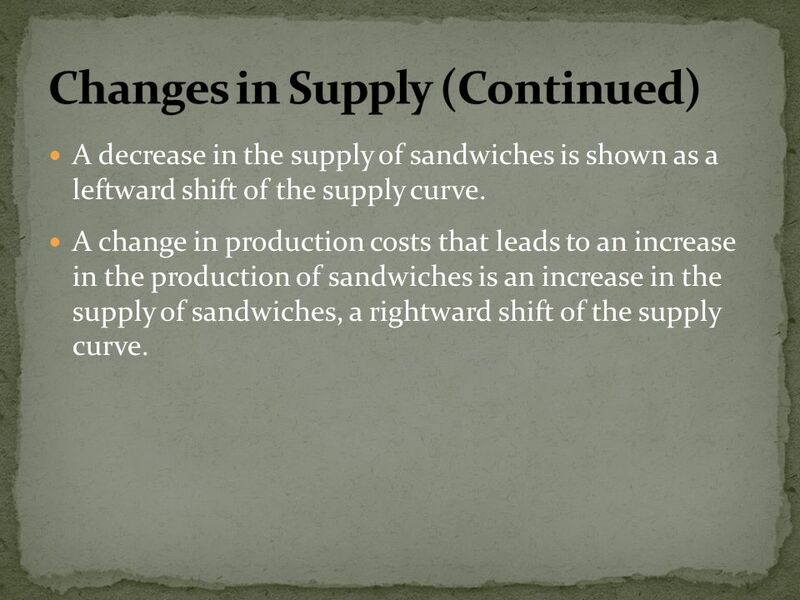 A decrease in the supply of sandwiches is shown as a leftward shift of the supply curve. A change in production costs that leads to an increase in the production of sandwiches is an increase in the supply of sandwiches, a rightward shift of the supply curve. 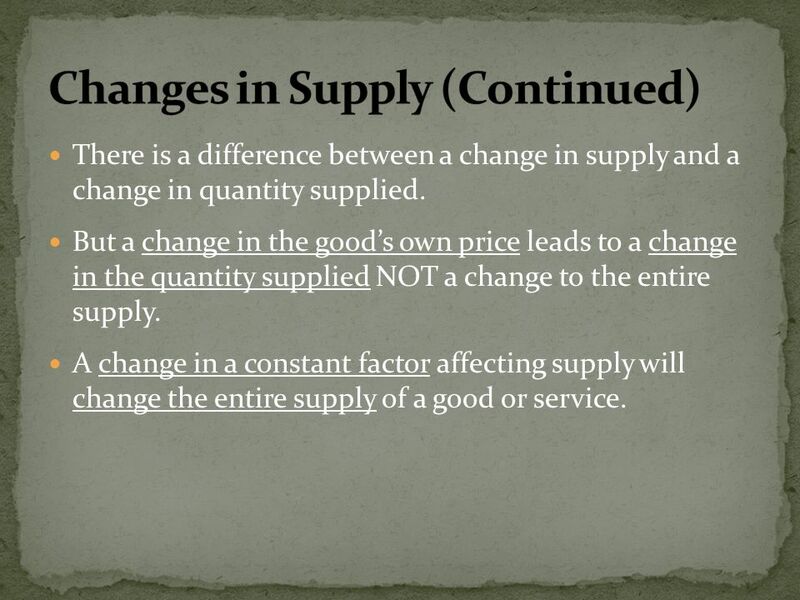 There is a difference between a change in supply and a change in quantity supplied. But a change in the good’s own price leads to a change in the quantity supplied NOT a change to the entire supply. A change in a constant factor affecting supply will change the entire supply of a good or service. The primary function of the market is to bring buyers and sellers together in order to establish a price and to make an exchange. Suppliers would find that as they lower the price for sandwiches they would be able to sell more sandwiches. At $3.30 there would be a surplus of sandwiches because suppliers would be producing 500, but consumers would be purchasing only 300. 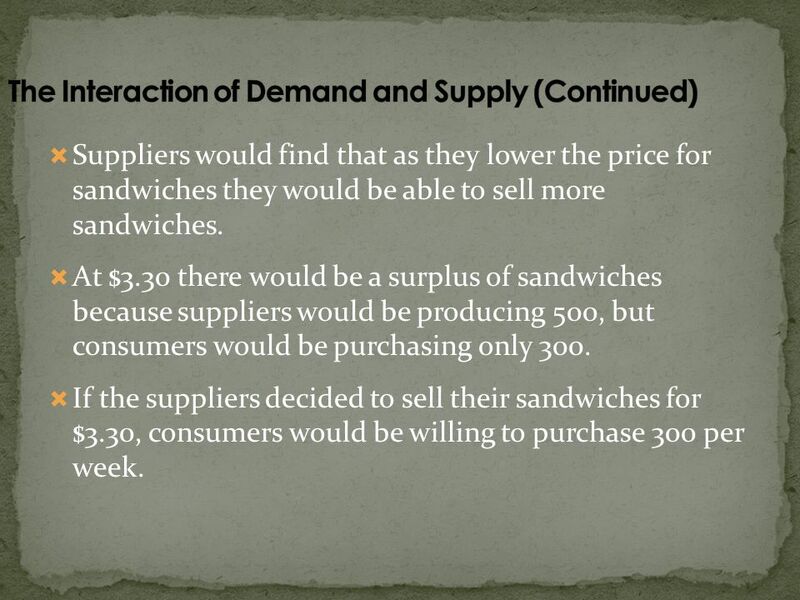 If the suppliers decided to sell their sandwiches for $3.30, consumers would be willing to purchase 300 per week. 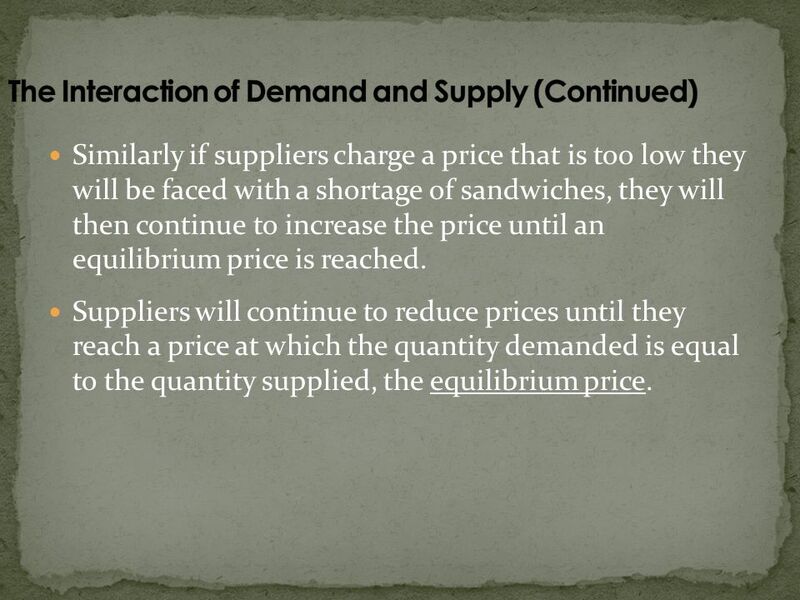 Similarly if suppliers charge a price that is too low they will be faced with a shortage of sandwiches, they will then continue to increase the price until an equilibrium price is reached. 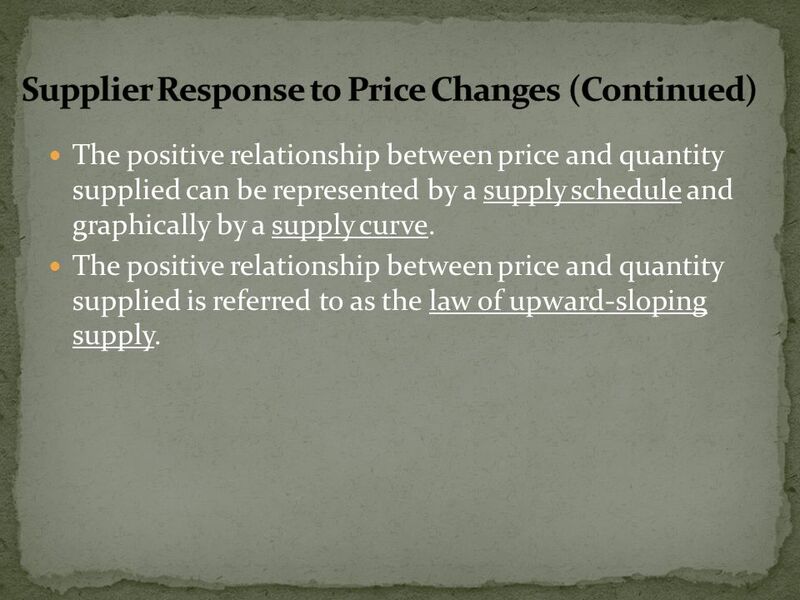 Suppliers will continue to reduce prices until they reach a price at which the quantity demanded is equal to the quantity supplied, the equilibrium price. 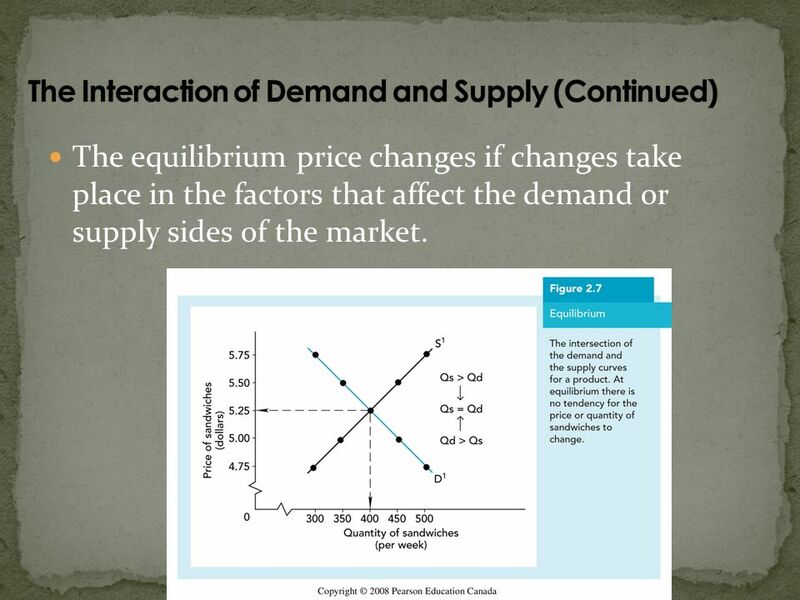 The equilibrium price changes if changes take place in the factors that affect the demand or supply sides of the market. 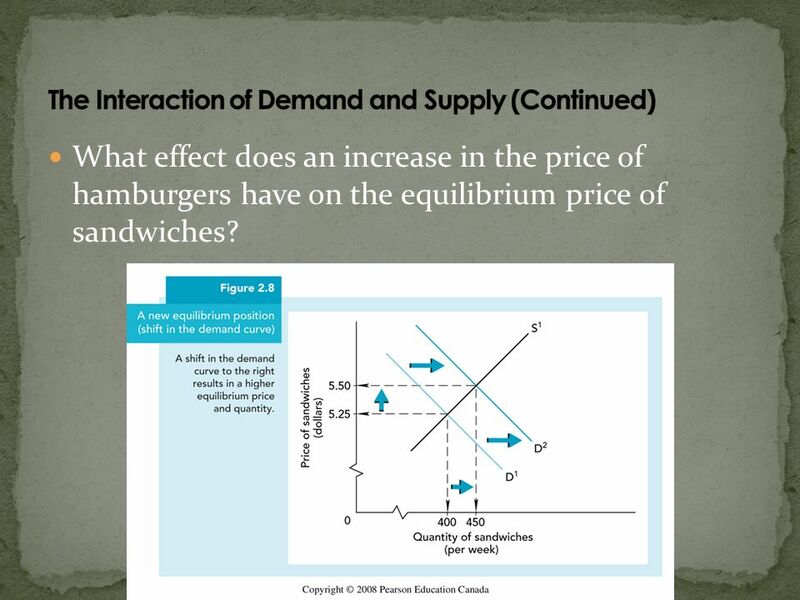 What effect does an increase in the price of hamburgers have on the equilibrium price of sandwiches? 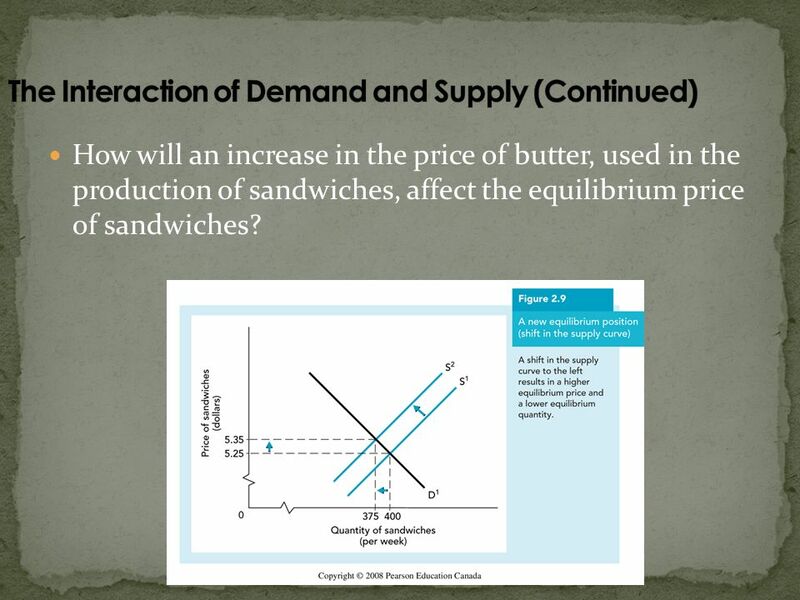 How will an increase in the price of butter, used in the production of sandwiches, affect the equilibrium price of sandwiches? In this way, the system of prices, rents, wages, and interest organizes economic activity. The price system is the technique by which scarce resources are allocated to the production of those products and services that provide the greatest return to the resource owner. 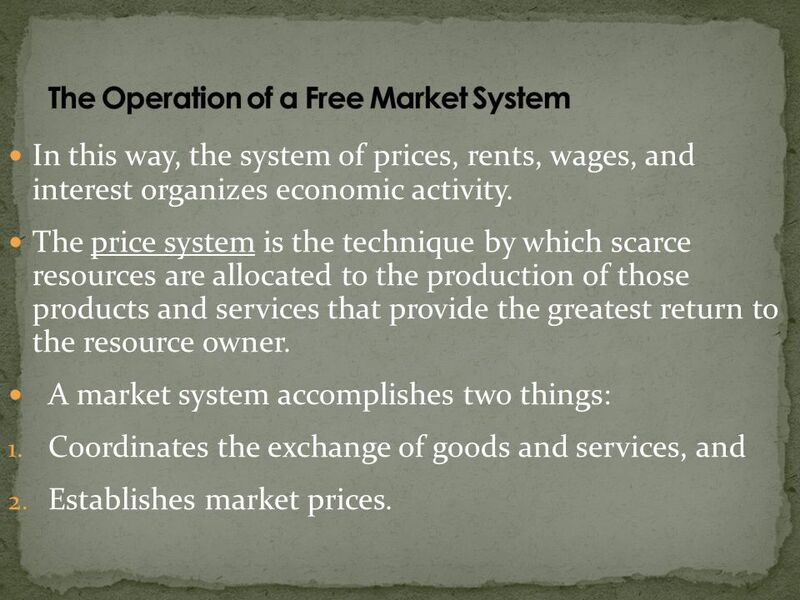 A market system accomplishes two things: Coordinates the exchange of goods and services, and Establishes market prices. 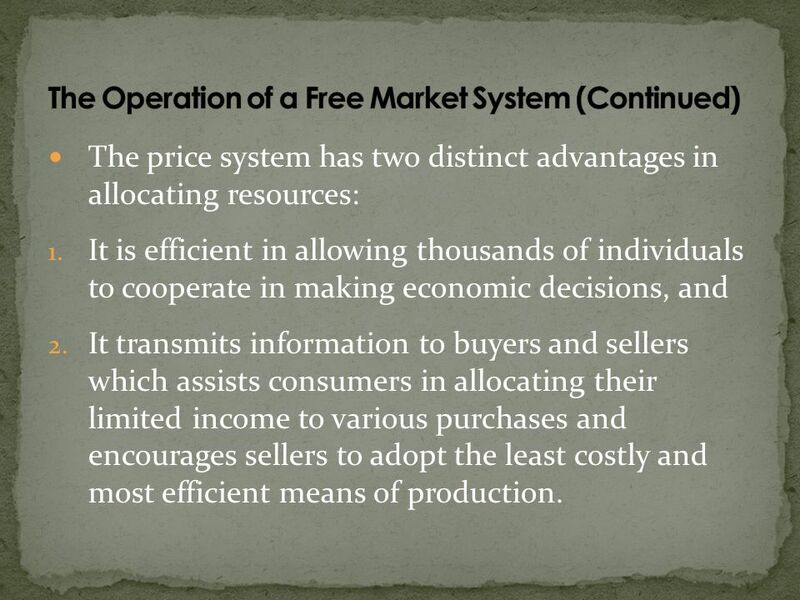 The price system has two distinct advantages in allocating resources: It is efficient in allowing thousands of individuals to cooperate in making economic decisions, and It transmits information to buyers and sellers which assists consumers in allocating their limited income to various purchases and encourages sellers to adopt the least costly and most efficient means of production. 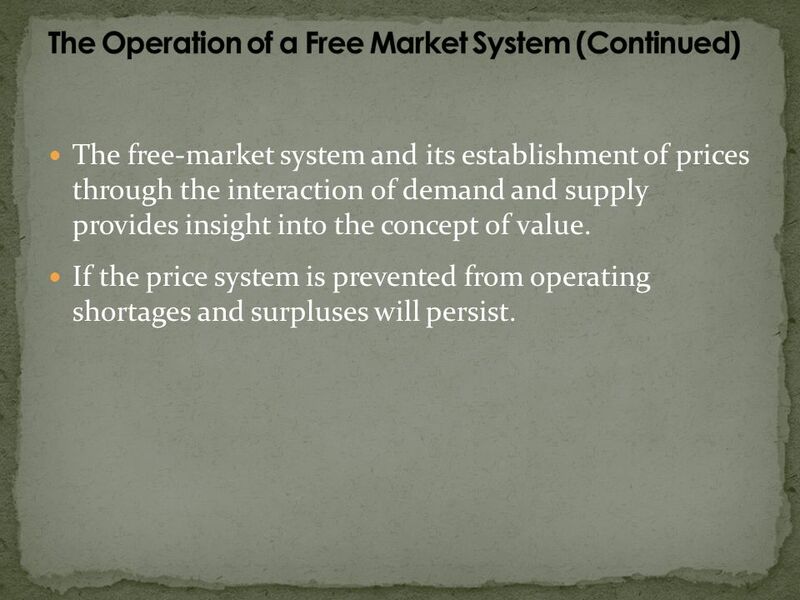 The free-market system and its establishment of prices through the interaction of demand and supply provides insight into the concept of value. If the price system is prevented from operating shortages and surpluses will persist. 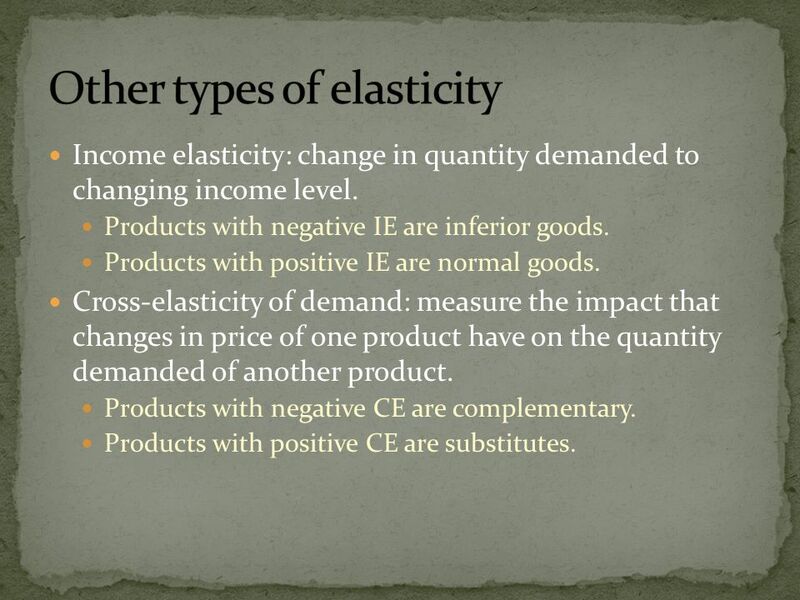 Income elasticity: change in quantity demanded to changing income level. Products with negative IE are inferior goods. Products with positive IE are normal goods. Cross-elasticity of demand: measure the impact that changes in price of one product have on the quantity demanded of another product. Products with negative CE are complementary. Products with positive CE are substitutes. 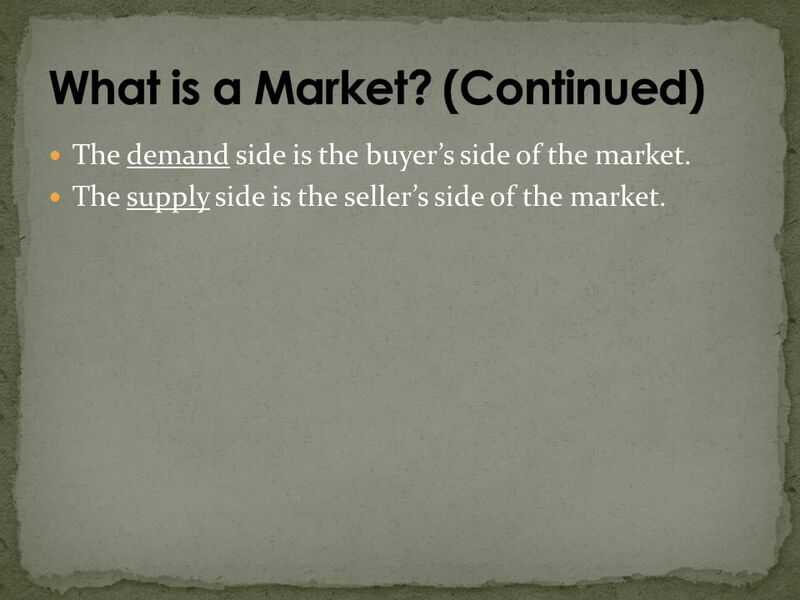 Download ppt "What is a Market? A market is the interaction of buyers and sellers for the purpose of making an exchange, which establishes a price for the goods or." 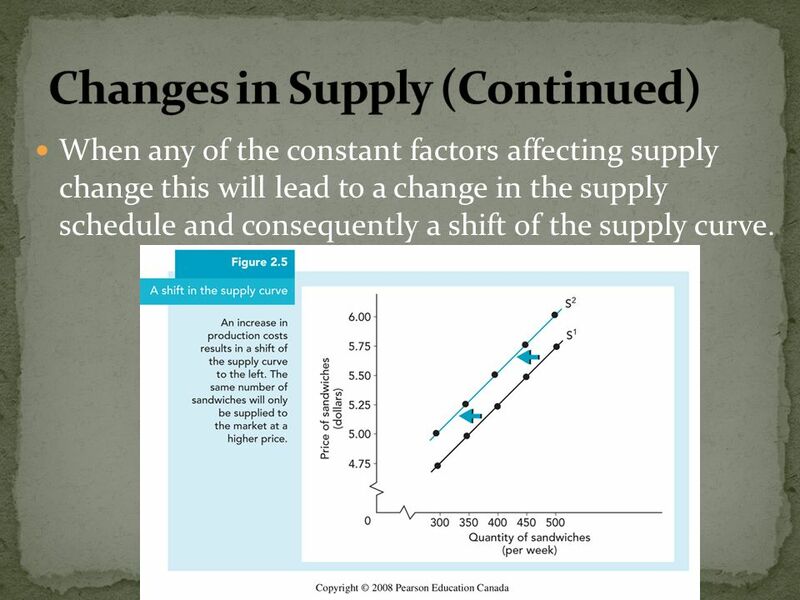 TCO 2 Given a supply schedule, a demand schedule, and a change in one or more determinants of supply and demand, graph the supply and demand curves and. 2 SUPPLY AND DEMAND I: HOW MARKETS WORK. Copyright © 2004 South-Western 4 The Market Forces of Supply and Demand. SUPPLY AND DEMAND I: HOW MARKETS WORK. Copyright © 2004 South-Western The Market Forces of Supply and Demand. 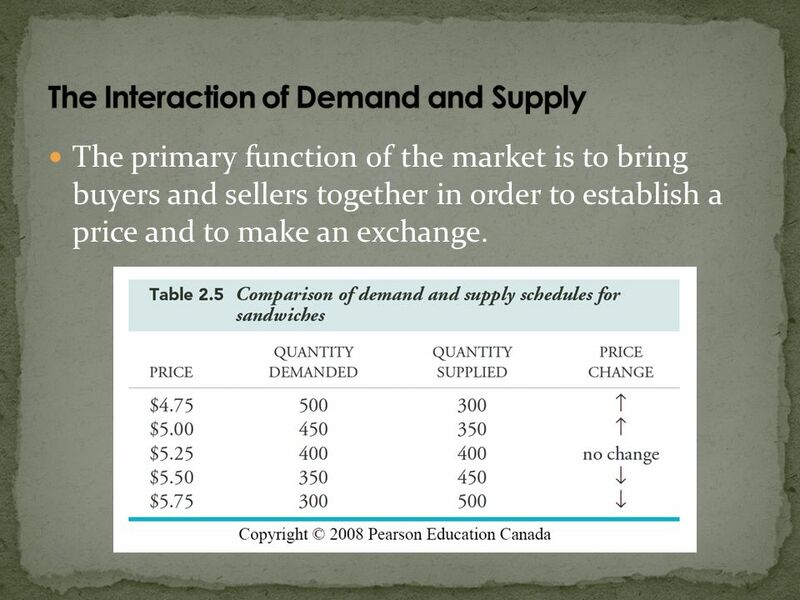 Chapter 4 Demand, Supply, and Markets © 2009 South-Western/Cengage Learning. 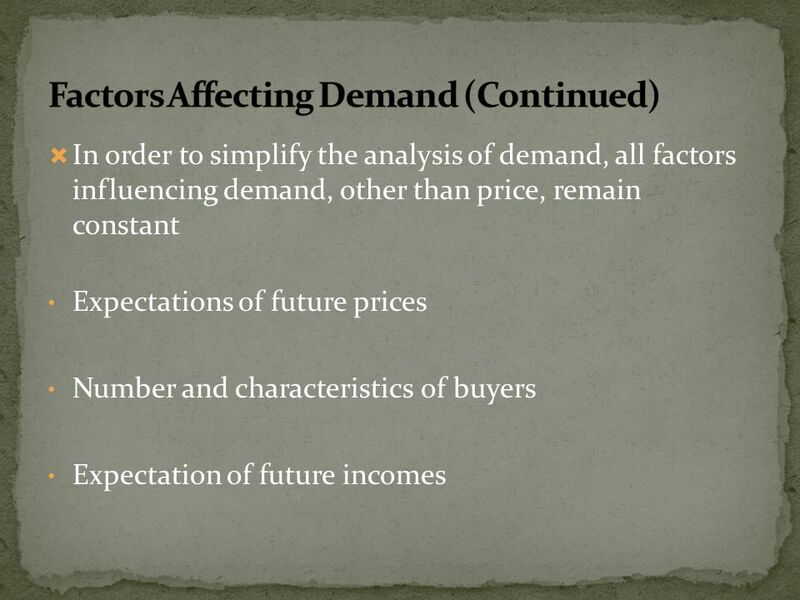 Demand and Supply Market and the Economy Demand The Demand Curve Demand versus Quantity Demanded Supply Supply versus Quantity Supplied Market Equilibrium. Copyright © 2004 South-Western SUPPLY Quantity supplied is the amount of a good that sellers are willing and able to sell. 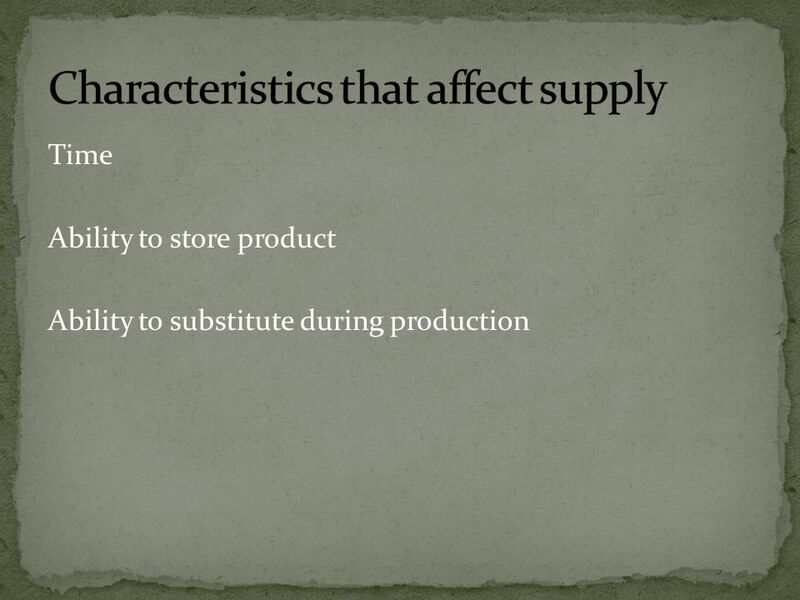 Law of Supply The law of supply. 1 © 2010 South-Western, a part of Cengage Learning Chapter 3 Market Demand and Supply Microeconomics for Today Irvin B. Tucker.